Implementation of projects by a non-profit (NGO) in Nepal comes with a number of legal requirements. One such requirement is holding a social audit of the project after completion. Another is a Monitoring and Evaluation (M&E) by the team from Social Welfare Council (SWC), the body that had oversight on non-profit activities in the entire country. After the completion of Taltuleshwori Primary School, social audit was conducted last August, about which you can read here. As for M&E of the first phase of the reconstruction project, a team from SWC visited Thangpalkot, Sindhupalchowk District last October. The evaluation team comprised of the Deputy Director, Mr. Durga Prasad Bhattari (Team Leader), and Senior Assistant, Mr. Prakash Chandra Bhatta (Team Member), ushered by COMMITTED’s Project Coordinators for Local Governance and Education. Funded by AVAAZ.org, the reconstruction of school at its first phase was completed in a span of six months with a total budget included NPR 50,70,000. SWC M&E Team Members (second and third from left), and COMMITTED’s Team members: Field Staff, Project Coordinator and Senior Project Coordinator, respectively (first, fourth and fifth from left). The monitoring and evaluation team analyzed the impact, sustainability, relevancy, coordination, compliance, transparency, accountability, financial operation and regularities, institutional capacity and achievement of the rebuilding project. 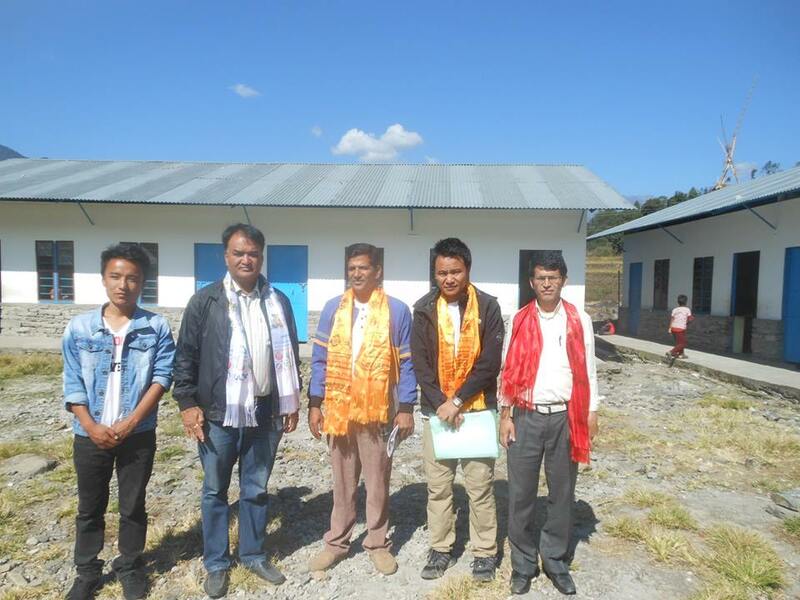 With a joint consensus of both SWC and COMMITTED, the evaluation concentrated principally on a review of existing project documentation like project proposal, progress report, audit report and Terms of Reference (TOR) and in-depth interviews with District Education Office (DEO), District Development Office (DDC), observation at project site, face to face interview with the beneficiaries in Thangpalkot ward, School staffs, School Management Committee Members, School Construction Committee members and local project staffs. A snapshot of ongoing discussion. The concluding remarks of a SWC M&E report reads thus. The school is currently serving 182 students and staff members of Taltuleshwori School. Finding the construction and implementation of overall project very effectual, the M&E team also provided some recommendations for future projects. This monitoring and assessment visit was completed in one phase with 2 days of full working hours. A group picture of evaluation team with members and students of Taltuleshwori School. Click here and here to go to Facebook Post and blog showing summary about social audits. Click here to go to a blog post about handing over of Taltuleshwori school. For blog posts about the progress of the reconstruction of Taltuleshwori School click here, here, here and here. Copyrights 2018 cminepal.org All rights reserved.